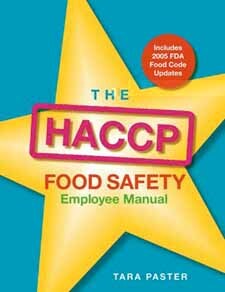 The HACCP Food Safety Employee Manual is designed to accompany The HACCP Food Safety Training Manual. It covers all HACCP principles, processes, and procedures, including prerequisite programs and food defense. This helpful guide also comes complete with a certificate exam that enables foodservice employees to demonstrate their understanding of the HACCP principles.